Pictured (left to right): Assistant Manager Shaun speaks to Hon. Stephen Dawson MCL, Member for Balcatta David Michael, and City of Stirling Mayor Mark Irwin at Balcatta Recycling Shop. Workpower kept the spotlight on sustainability as the organisation played host to the Hon. 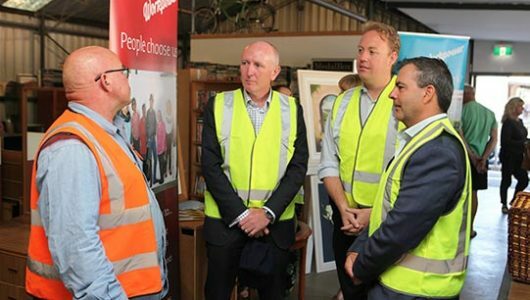 Stephen Dawson MLC, Minister for Environment; Disability Services; Electoral Affairs at Balcatta Recycling Shop. Accompanied by Workpower CEO Lee Broomhall, City of Stirling Mayor Mark Irwin, and Member for Balcatta David Michael, the Minister toured the site and explored the work that saw Workpower awarded Waste Team of the Year at the 2018 Infinity Awards. During the visit, the Minister also saw first-hand the many opportunities created for people with disability by Workpower’s management of the Recycling Shop. To find out more about Balcatta Recycling Shop, click here or follow us on Facebook.